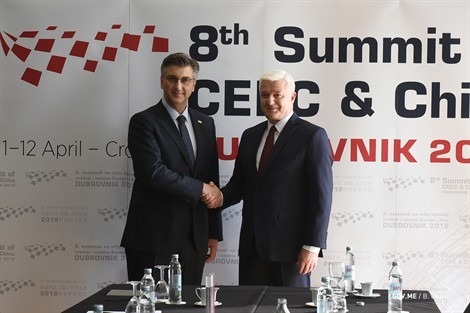 Podgorica, (MINA) – Prime Minister Dusko Markovic said that he expects further progress of bilateral relations with Croatia in all fields, as well as that he has significant expectations of the Summit 16+1, taking place in Dubrovnik. According to the press release from the Government’s PR Bureau, Markovic met on Thursday with his Croatian counterpart Andrej Plenkovic, with whom he discussed bilateral relations and advancing economic cooperation. “We discussed how to further improve bilateral relations, maintain a high level of political dialogue, but also upgrade economic cooperation within the region”, said Markovic, who is participating in the Eighth Summit of Heads of Governments of Central and Eastern Europe Countries and the People’s Republic of China, taking place in Dubrovnik on Thursday and Friday. Markovic noted that he agreed with Plenkovic that during this year, within the preparation for taking over the presidency of the Council of the European Union, Croatian Prime Minister will visit Montenegro and on that occasion they will discuss all the options related to the Western Balkans and its progress towards the EU, which Croatia could have in its agenda during the presidency. “We also started discussion on some conditionally outstanding issues. We agreed that these are not issues that are unsolvable, but that we need to solve them in short term and show the ability to be responsible and able to solve outstanding issues and not archive them”, Markovic told the press following the meeting with Plenkovic, and added that in the future he expects further progress in bilateral relations in all fields. Asked by reporters about his expectations of the 16+1 Summit, Markovic answered that Montenegro’s position was based on very good political relations with China. “Within this process, we also discuss cooperation in the field of economy and infrastructure development. You know that we are almost in the final phase of the construction of the first section of the motorway in Montenegro. I will use an opportunity to, during my meeting with Prime Minister Li Keqiang tomorrow, stress the importance of this project and the significance of completing this project by mid-2020”, Markovic said. According to him, they will also discuss the continuation of cooperation on the motorway construction, since Montenegro has already received an offer from the CRBC, according to the model of private-public partnership. “It is my great pleasure that within this Summit, and supported by other Summit participants, we will be able to discuss the establishment of a creative hub in Montenegro for all members, which is very important in terms of cultural cooperation, innovation”, Markovic said. He added that these are all the issues that will be part of the Summit agenda, stressing that he has significant expectations of the Summit.